Box Dimensions (LxWxH) 7.3 x 4.8 x 4.7"
RF 35mm f/1.8 IS Macro STM Lens is rated 4.3 out of 5 by 21. Rated 4 out of 5 by Claude from Good lens A bit larger than expected. Front element not well protected, I like the large back element though. Autofocus a bit noisier than expected. Very good image quality overall, macro is great, small chromatic aberration, maybe 2.3 stop vignette at f1.8, really large comma wings on hor. edges and corners at f1.8 always well defined cores, comma improves at f2.5 and goes away at f3.2. IS is impressively good. The 2 rings are a bit too close but otherwise great to have. No weather sealing (really?). When camera is powered off lens goes on some intermediate aperture around f5. Lens works only with RF mount, not even EF-M (sadly!). Price is reasonnable for what you get. Rated 5 out of 5 by Elliott from Essential for EOS R It seems that all four of the EOS RF lenses are fantastic, and this little guy is no exception. It is small, light, sharp (oh, so sharp! ), fast, and versatile. Since I got it a couple of weeks ago, it has not left my R at all. The 24-105mm f/4L IS USM is also a fantastic lens, but no one would ever accuse it of being compact. The only thing wrong with this lens is that I wish it was a touch smaller, e.g., closer in size to the EF 50mm f/1.8 Nifty Fifty, or (better yet) the EF 40mm f/2.8. Go to a real lens reviewer for details on the ultimate IQ - I have included two pretty good examples of the IQ that I am getting: A close up (about 1/5 life size) of a mushroom and a 100% crop onto a little girls tee shirt, taken from about 2 feet away. Rated 5 out of 5 by John from Killer Combo: Versatility, Value, Quality Im a huge fan of good affordable primes due to the value they deliver, and judging by the amount of time this one has spent on my R since I bought it, I have to say its my current favorite. It is just so, so versatile, and the image quality is excellent. The 35mm focal length is great for a variety of uses, f/1.8 and IS make it a champ in low light, its fun to use as a macro (even though you have to get really close to the subject), and the STM and IS combo make it great for video. Its the exact lens Ive been waiting for Canon to make. Highly recommended. Rated 5 out of 5 by Victor from Primes that dont break the bank. Im using a 24-105rf and now this rf35 f/1.8 on my EOS R. This lens has lovely Bokeh, nice build and super fast af plus solid stabilization. No weather resistance that I can see but at this price point this is what we get. Wide open at f1.8 this lens matches the 30 megapixels very well. The weight is a miracle compared to how all these features work together. Manual focus is great once rotation Menue 5, choice 4 RF lens sensitivity to linked. Also leave MF peaking on high red menue 2 choice 1 and another setting I like is Menue 4 choice 1 lens electronic MF. I set mine to One shot enabled magnify. I will need to press shutter half way and will in MF not AF view is magnify-ed to possible 10 to 1. Although the AF is great on both my lenses, Manual focus brings out creativity not capable with modern AF systems unless you have full time over ride. Looking at my DNG files from Adobe 11.1 Im able to change over the CR3 files to DNG and transfer them to LR6. Files look great with the smoothest transition in Bokeh I have ever seen for such a inexpensive lens. You cant go wrong with this one if you building your R mount lenses. Also in the menu its a good idea to set lens to retract when powers off, menu 5 choice 4. Rated 5 out of 5 by Angelia from So Fast! When the new EOSR came out, I was very much hoping that at least one of the early lenses would be a macro lens, since I get a great amount of enjoyment from macro photography. I was thrilled when the 35mm f/1.8 IS Macro STM Lens was announced. Getting it in the hand, it is so small! Im not used to that for a macro lens. In addition, its autofocus is also blazing fast! I cant wait until spring when I can really put it through its paces. Rated 5 out of 5 by Matthew from The forgotten RF lens...Excellent! At first glance this seems to be the least exciting RF lens from the original four. Ive had a difficult time reading much about it because everyone is excited about the other three, understandably so. I was a little hesitant about buying it because Id read it focuses slowly and it is loud while focusing, etc, making me think it was a bit of an afterthought in design by Canon just to fill the gap. I went ahead and bought it because as much as I love the RF 24-105, its a big, heavy lens and I like to have a smaller, faster lens for more general walk around, street photography, and 35mm provides a good general use field of view. I figured at this price point, I didnt have too much to lose. Im very happy to report that I have been pleasantly surprised. Not only is this lens small and light, it also has excellent image quality from f1.8 and up. No hyperbole; it is actually extremely good. If it isnt quite L quality, then it is dang close. Sharpness, color, contrast, background blur, all really good for a little plastic lens. It is true that it isnt the quietest lens at times. When trying to focus in macro range, it does make a little buzzy lens focusing noise. However when shooting in more typical ranges, it barely makes any noise and I did not find it slow at all while doing street photography, it seemed as fast as any lens on my Fuji X-T3. Im not a stranger to DSLRs but for the last few years Ive been using smaller mirrorless cameras so switching to the R was a jump up in weight/size, but putting this little prime on it has really increased my enjoyment of transitioning back to full frame. Rated 4 out of 5 by Joseph from Sharp non-L lens Really sharp with great image quality. I only gave it a 4 because Canon doesnt ship a lens hood with it and the weird looking one that they show for use with it isnt available anywhere. Sure its a macro lens but it is also a good walking around lens if you like the 35mm FOV. F1.8 and IS, what more can you ask for for $499. How bad is the lens breathing for video recording? While we do not have specifics on this lens' breathing for video, it is a photography lens first and foremost. You can expect there to be a good amount of breathing when used for video. What lens hood should I order for this lenses? I did not get a lens hood. It works quite well. I&rsquo;d recommend purchasing the lens and using it a bit before deciding on a lens hood. Because of the design, a lens hood may be unnecessary. what are the other lenses compatible for this Eos R? EOS R is compatible with any Canon RF lens. 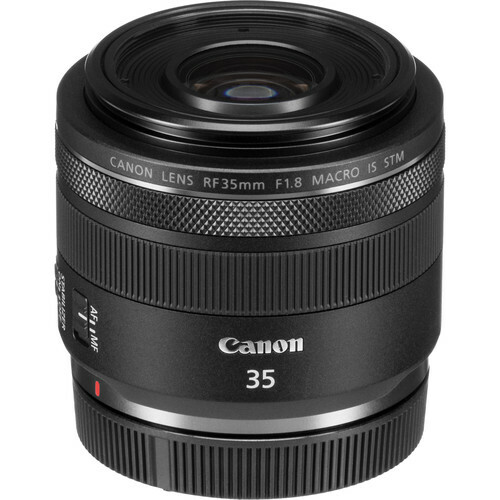 Just search this website for &quot;Canon RF lenses&quot; and you will see them all listed. Currently, four genuine Canon RF lenses available. Plus a couple 3rd party manual focus lenses coming soon (Meike, Kipon). Canon is releasing 6 more RF lenses this year (2019). It's compatible for sure, as it is an RF lens. Compared to ef 35mm f2 is, af speed and sharpness? Does this lens come with the Canon EW-52 Lens Hood ? Mine didn't come with hood or pouch. Is it compatible with EOS M system?